Nice bike. I see that you have the same tilted-back rack issue that my 25.5" frame has with a normal rack (unless it's the angle). I even cut off a couple of inches of the rack stays of the Jim Blackburn rack that came with mine and it was still tilted with the front of the rack practically sitting on the seat stay. The problem was solved beautifully by the Axiom Streamliner DLX Disc rack. The "Disc" part is the key because it has extensions where it connects to the dropouts that move the whole rack back a couple of inches, allowing you to tilt it forward until level. Awesome and highly recommended. Can finally fit normal panniers on it. 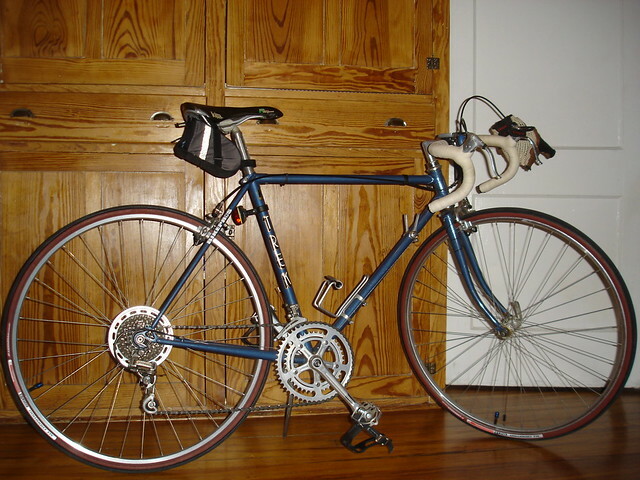 84 Trek 660. Just finished building her frame up with a mostly DA 7700 drivetrain. Here is my Trek 400 with an axiom streamliner rack. Machine Age is right. This rack has considerable rear offset that really reduces the heal strike issue. This build-up has been a lot of fun over the last year or so. Mostly used 105 parts and some random stuff from my parts bin. The most expensive were the textro DA brake calipers. I had to buy them to get proper adjustmet on the wolber wheels. I'm over downtube shifters. 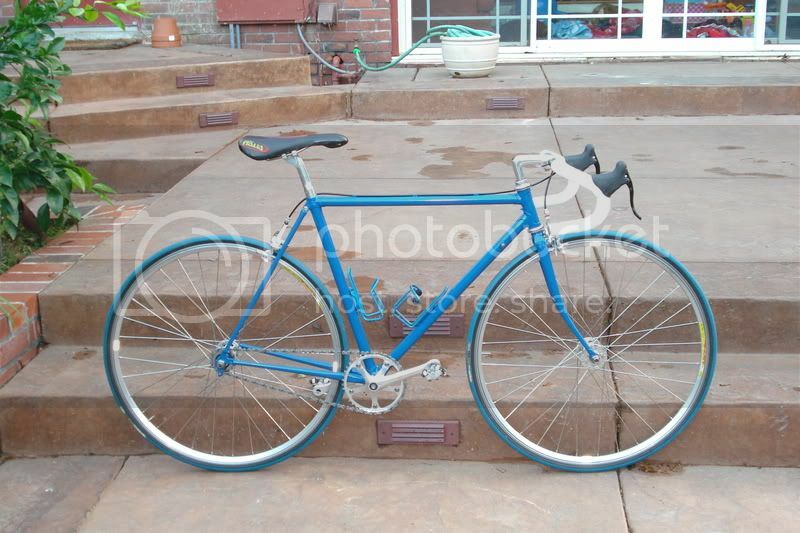 I might spring for some 8 speed st-2200s next year. Last edited by Zap Hassellhoff; 05-21-11 at 04:39 PM. -Switched from the Cinelli cork tape to Greengrips cloth tape. I decided I just don't like the feel of cork on moustache bars. It was gray when I first got it, and had it powdercoated. It started developing rust under the powdercoat so I stripped it off. I really like the naked steel -- I may just buff it up and spray it with rustoleum rust inhibitor and ride it like that until rainy season returns. I'll post some pics later. 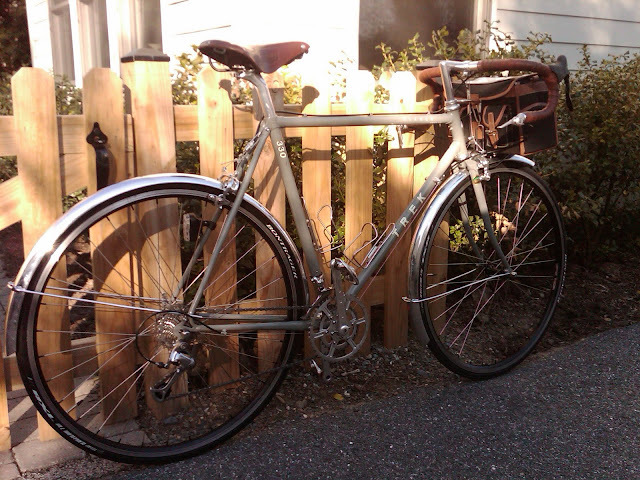 Just put on a Shimano BR-L490 SLR on the front. Going to be swapping out the Helio-junk rear hub and looking for 105 cleat pedals next. Got it from a friend's dad for free. It will be a fun project and my fast ride for a long time. Last edited by NukeouT; 05-24-11 at 03:14 PM. Thanks! The fenders are super long. I mounted the front one forward on the brake bolt to bring it up a bit actually. I would prefer all fenders are sold with a drilled or not option. Are those longboards aluminum or the polycarbon/aluminum composite ones they're also making? I got a set of the latter a couple of weeks ago. If I hadn't already committed to them from the LBS, I would have done all aluminum. These just look kinda flimsy. VERY nice build on your Trek, btw. I've putting my 614 together with moustache bars, also. I mean, they haven't arrived, yet. But, that's the intention. Be at the LBS in another day or two. Can't wait. How do you like the ride with them? Do you find it easy enough to still reach DT levers? I thought I might move mine up a bit closer towards the headtube. My 614 is an '82 and came with Symmetric shifters. I'd hate to need to use something else. 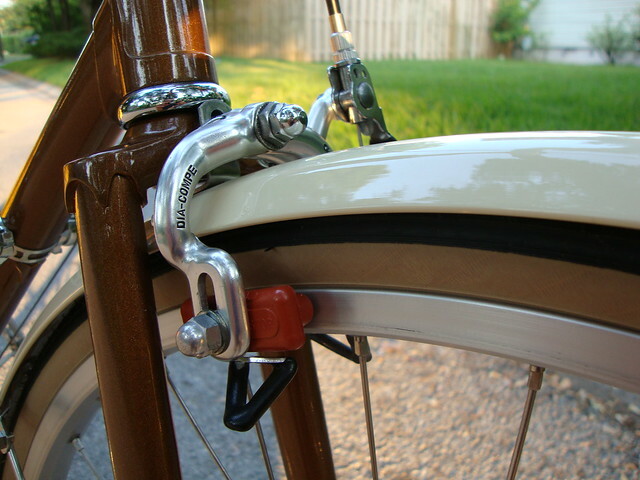 They'r perfect for shifting easy with one hand since the levers sit right next to each on top of the downtube. 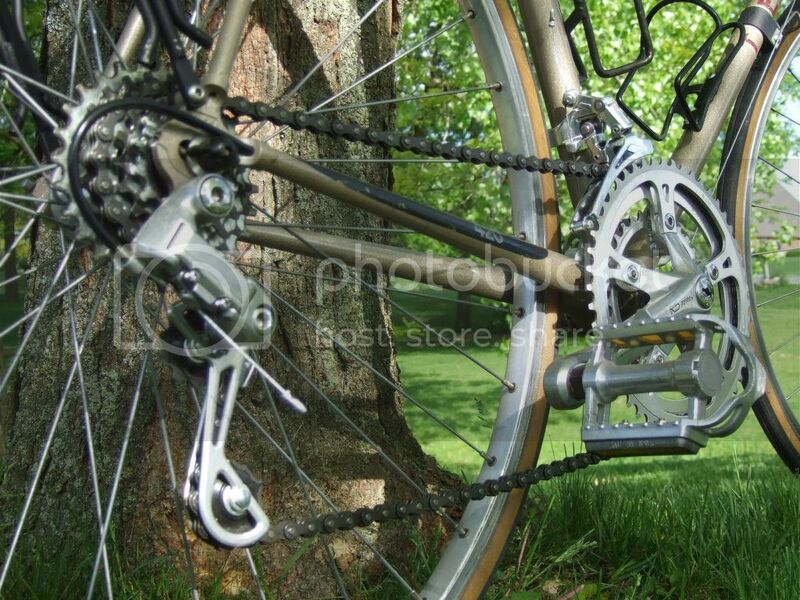 Kind of annoyed that our derailleur does not have a quick release cage like some Suntour models. 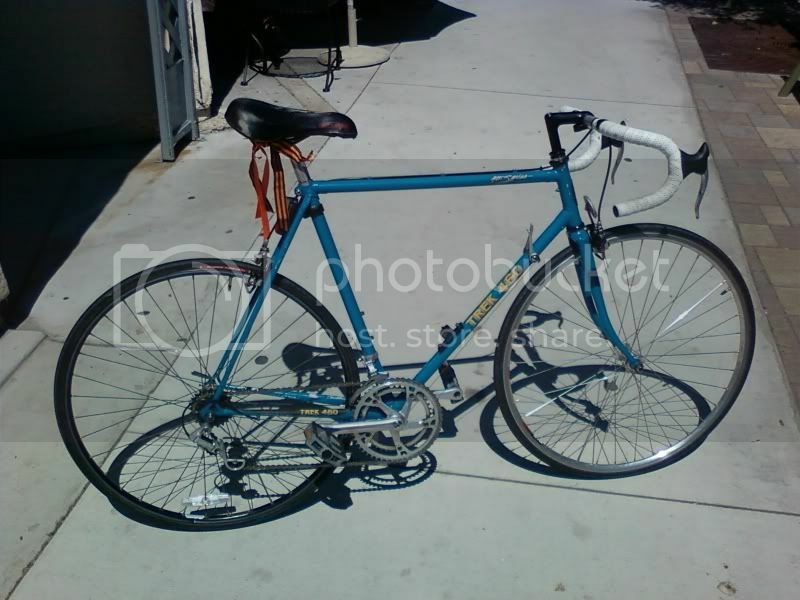 The older Suntour GT's with the open cages had/have less chain wrap capacity, though. And, that really limits the gearing range one can build. Here's me-- and '87 elance 330... with no original parts. If I'm not mistaken-- the 330, the 400, and the 440 were all the same frame.. just different components. love love love this bike. just a coupla days from putting a set of open pro/105 wheels on it to get rid of the last vestiges of black anodized-ness- and tan sidewalls have returned..
@shorthanded: really nice choices on that build! 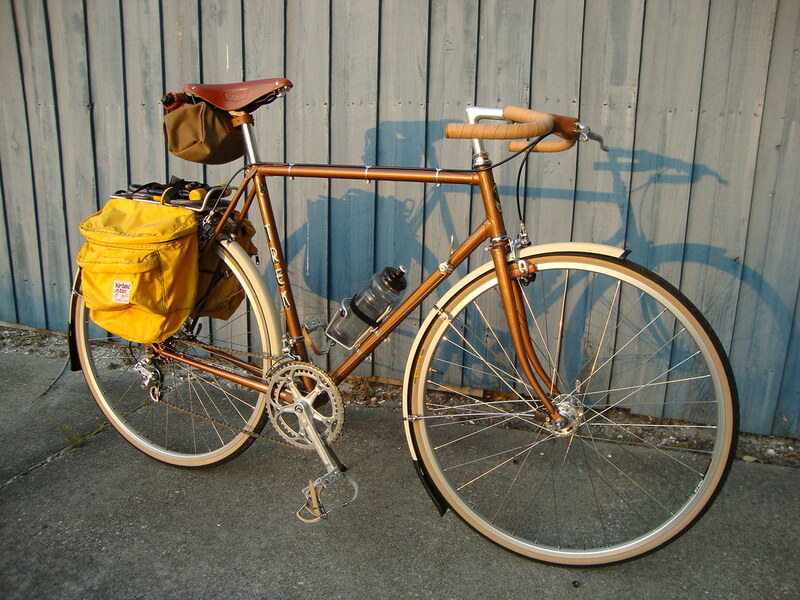 I really like the front bag and the cranks. The fenders I have are the....I think they call it "chromoplastic"? Which I believe is the plastic coated aluminum. They're plenty tough and with the stays installed they are quite rigid. I don't expect them to let me down any time soon. As far as the shifting on the down tube with moustache bars, I find it quite easy actually. Being that they are wide, I feel very stable with one hand reaching down to shift. If anything, I actually think it's easier than with drop bars. Good luck with your build, I hope you post some pics soon! Me, too...hehe!! All the rain we've been having has slowed building progress significantly. Thanks for answering. Yep.........they're called chromoplastic. I got the silver variety, and I can see I will have to mount the front one behind the brake caliper as you did. Them suckers is longboard, indeed! 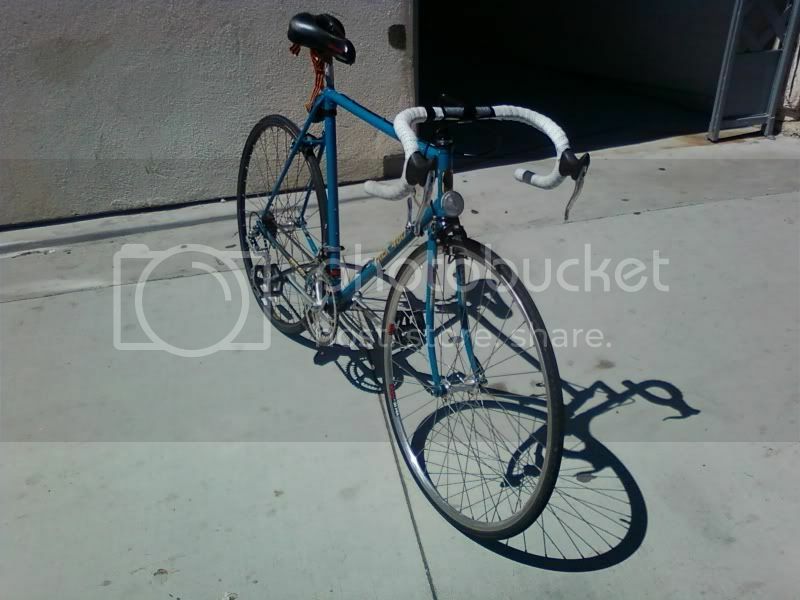 I really need to upgrade to 700c so i can fit some fenders on my bike. I agree. That'n is bad to the bone. I actually like the black wheels with it, myself. A touch of modern with some vintage class. Yep.....this is one of my favorite threads. Yay, another place to post a photo of my '86 Elance 310 that some fool was throwing out with the trash. Throwing it out????!!!!! Geez........I just don't get it. Black wheels are the awesome! Thanks! Yeah the suckybrake is a (bad) joke from the ssfg forum, the other bike is my Townie, it's an old Velo-Sport "Courier 12" I converted. 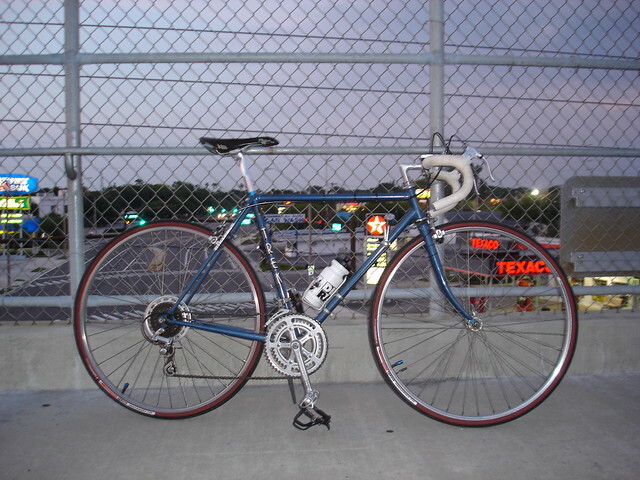 1981 Trek 614. 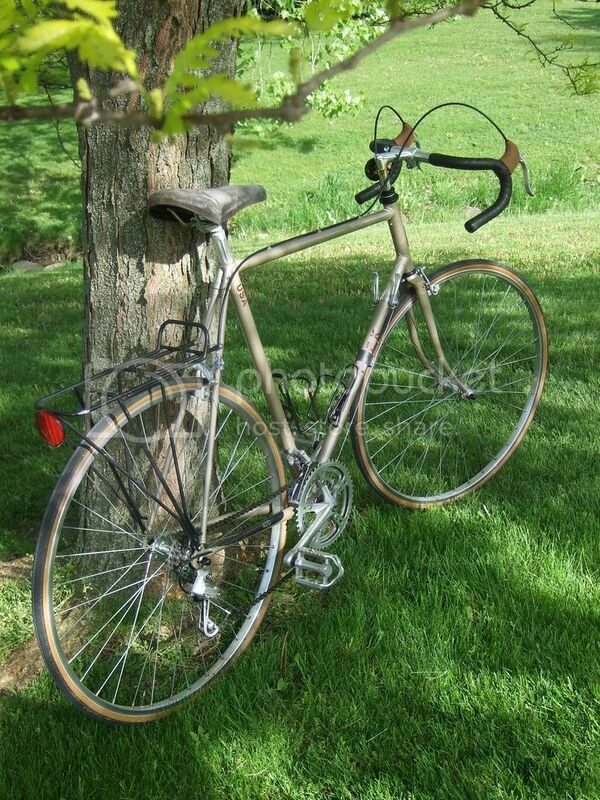 This was my first road bike. It saw many, many miles before I sold it. I wish it was my size, I loved this bike. this is on my last ride with this bike. parts live on at least three of my other bikes. 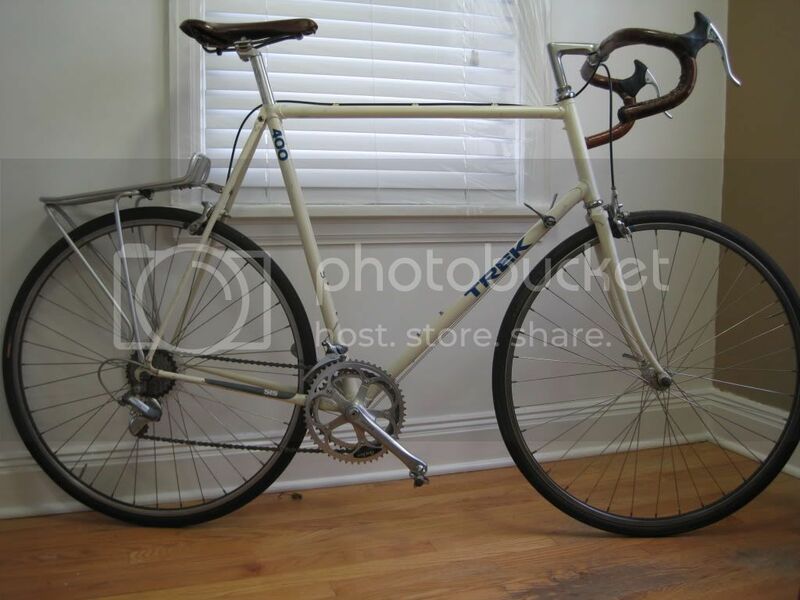 1980 Trek 412. This was going to replace my 614, but I came across the 613 shortly afterwards, and this bike was sold. thanks guys! i got lucky and snagged the frame for nuttin' from my local trek rep who was using it as a fixie.. i believe i've put the world right again.